These rugs are great! Color works well in my bathroom and they stay in place well! Very soft and comfy on the feet! I ordered two round and one square and they are exactly what I wanted! DII offers 100% cotton crochet bath mats in four sizes/shapes and varies colors. Sizes include 17x24" Oval, 21x34" Oval, 28" Round, and 24x24" Square. Colors include, Gray, White, Cameo Blue, Yellow, Blueberry, and Mauve. Mix and match sizes and colors for a great pairing, two bath mats together: one in front of the bath tub and one in front of a single sink. Or you could also pair two mats in front of a double sink for a unique look. Dimensions 28.0 In. X 28.0 In. X 1.0 In. 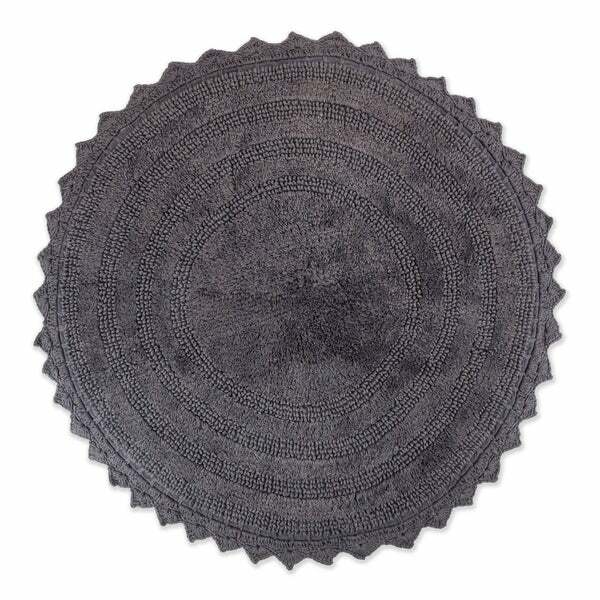 I was looking for rather small gray rugs for a guest bath. One goes in front of the sink; the other will be used as a bath mat. I wanted one not too thick so the bathroom door would easily close over it. I also like the fact that these rugs can be washed. Looks as pictured -- the white bath mat is a true white (or at least, close enough that we can't tell the difference against our white shower curtain) and looks great in our black and white bathroom. I bought this is white. It seems very well made and truly a nice looking rug. I love the fact that is is machine washable, but I have not washed it yet. I plan to go back an order one other color since it is so pretty! I bought the 24 inch square andit was perfect for the space. Soft and looks great. The color is exactly as shown in the picture. I'm very happy with my purchase. We love them. Bet you'll never guess how we're using them??? We are using them as head-rest covers for our LazyBoy recliners. Works great and looks fine. Lux 30 Round - 30"